Exploring a city at night and finding the different activities only available at that time will feel like you’re exploring a whole new city. And there’s nothing better than taking a city you’re in and seeing things and doing activities that are not available during the day. The Collective Markets is not just your ordinary night market. The 3-day weekend market is the only one of its kind in Brisbane. With that said, you can check out a lot of things in the area including artistically crafted item, food, souvenirs, and a whole lot more! It’s indeed a great way to spend an evening before or after dinner. There’s just something appealing about reclining chairs, and freshly buttered popcorn that gets you relaxed just thinking about it. There are a few open-air cinemas around Brisbane for you to check out. Ben and Jerry’s Openair Cinema, held at the Rainforest Green in South Bank is the most popular. Often available from September to November, you can catch some of the latest movies as well as some classics you are not going to want to miss. Entrance to the cinema is $10 for concessions, $18 for adults, $40 for the Star Lounge, and $60 for a group of four. Seeing a city’s skyline from a great vantage point is breathtaking. And when you take a ride on the Wheel of Brisbane, you will be treated to city lights and the night sky like never before. The Wheel of Brisbane is located in South Bank and is also one of the city’s most recognizable landmarks. It is composed of 42 enclosed capsules. Each capsule can accommodate up to six adults and two kids. It also takes about 12 minutes to complete the rotation, with various stops as it lets people on or off. Ever wanted to try kayaking? 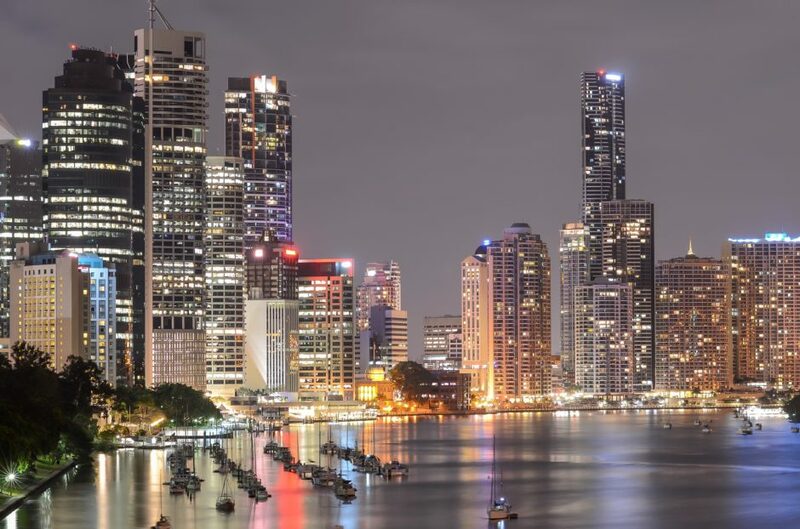 If you choose to do it in Brisbane River at night, you will also have the option to have dinner after. And of course, you will be given a choice to have some beer with your meal. It’s a great way to spend a Friday or Saturday night, just paddling along the river and seeing the city glow just beyond your reach. Rock climbing is a fun sport that lets you test out your skills and climb rock mountains. It’s a great way to stay in shape and to take on new challenges along the way. But most people often do it in the day, where the sun is out and beating on the back of your neck. So, why not try it at night? Kangaroo Point Cliffs offer night climbing sessions for those who want to try the sport with a twist. The staff will teach you everything you need to know about rock climbing, and the mountains have a height of up to 20 meters, so you can expect the adrenaline rush will be unlike any other climb you’ve had before. The best part is that this activity is open to anyone who is willing, and beginners are always welcome to try it out. Go and see this beautiful city at night and try out everything it has to offer. Whether you’re a local or a tourist, you’ll find that these activities are always worth trying at least once. And to get to your various activities at night, get a Brisbane car hire service to avoid the hassle. Posted in Australia and tagged with travel. RSS 2.0 feed.